JACOB sets standards in food safety. 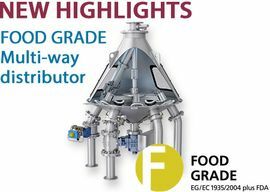 Our new FOOD GRADE range is the first and only product range in our market segment in Europe to meet the stringent requirements of the European regulation EC 1935/2004 as well as the American FDA food regulations. 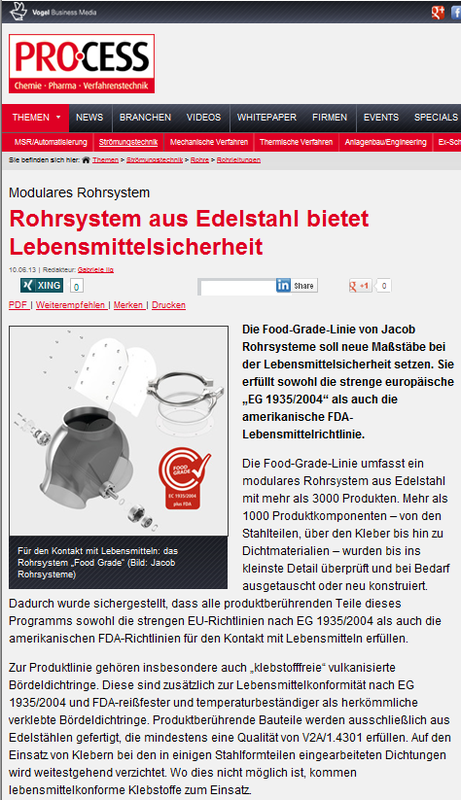 With its FOOD GRADE range, JACOB is the first and only manufacturer of modular pipe systems in Europe to meet the requirements of both EC 1935/2004 as well as the FDA food regulations. 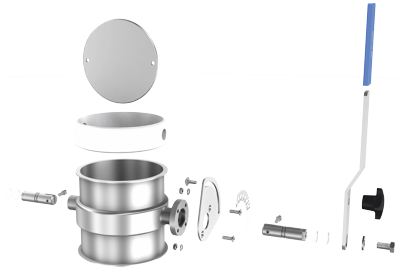 FOOD GRADE is a modular pipe system of stainless steel with more than 3,000 products. 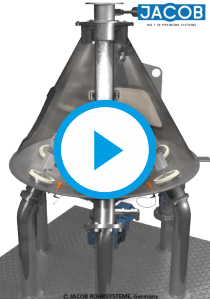 For your safety, we have spent several months meticulously checking more than 1,000 product components and replacing or redesigning them where necessary. This ensures that all parts of our FOOD Grade products that come into contact with food satisfy the stringent EU Regulation EC 1935/2004 as well as the American FDA regulations for products in contact with food. 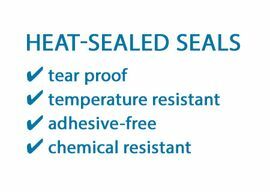 In particular, we use adhesive-free heat sealed U-shaped seals and ring seals that exhibit improved technical properties: More tear-proof, chemical-resistant and temperature-resistant than conventional chemically bonded seals. All components that come into contact with the food product are made exclusively of stainless steel of 1.4301 (304) or 1.4307 (304L). We avoid the use of adhesives wherever possible, and in situations where their use is unavoidable, we use only food-grade adhesives. Our new DETECTABLE DESIGN line is a consistent expansion of our FOOD GRADE range. All seals in this product line are made of silicone and incorporate tiny metal particles. This means that they can be identified by metal detectors. If a seal or any part of it should find its way into the production process, then these foreign bodies can be reliably removed. It goes without saying that all products in this line are both EC 1935/2004 and FDA compliant. 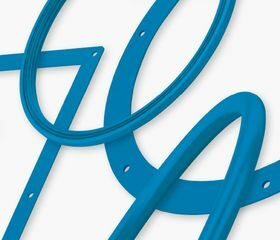 U-shaped seals and ring seals are vulcanised and so are adhesive-free. Why is conformity with EC 1935/2004 so important in Europe? There is no impairment to the taste and smell of the food. Directive EC 1935/2004 has been effective since 3 December 2004 as a directly applicable and binding law in all member states of the European Community. 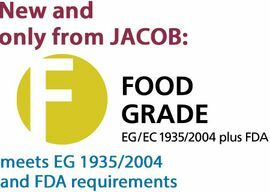 With its FOOD GRADE range, JACOB is the first and only manufacturer of modular pipe systems in Europe to meet the requirements of both the EC 1935/2004 and the FDA. 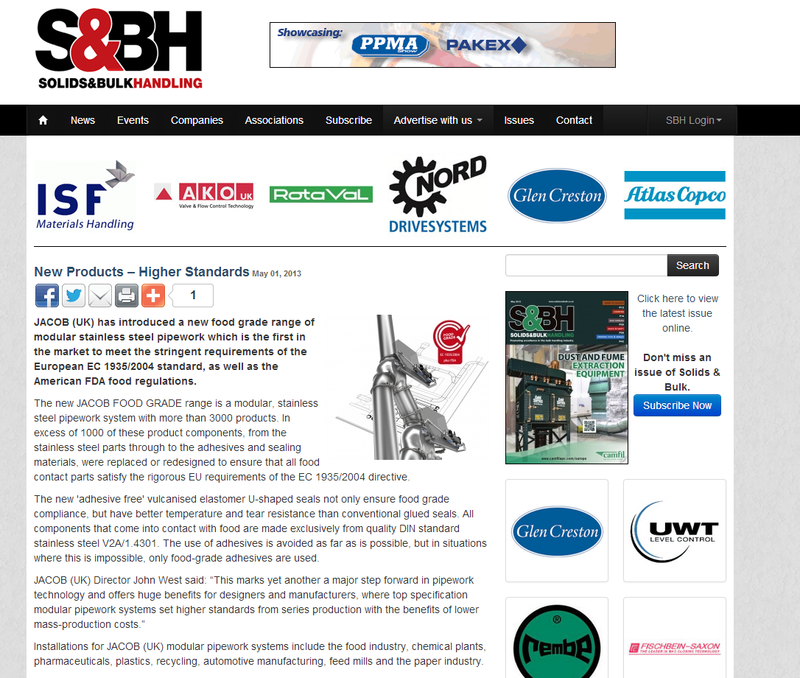 Which JACOB products are FOOD GRADE compliant? Our FOOD GRADE RANGE encompasses more than 3,000 products and is based on our modular stainless steel range that you are already familiar with from our product catalogue. All the parts of our FOOD GRADE products that come into contact with food satisfy the stringent EU requirements of the EC 1935/2004 directive as well as the American FDA regulations regarding contact with food. To help you identify which components are FOOD GRADE, and to avoid any misunderstanding, only components which we deliver with a FOOD GRADE declaration of conformity are actually FOOD GRADE compliant. To ensure your safety, only those of our products which we deliver with a FOOD GRADE declaration of conformity are actually FOOD GRADE compliant. 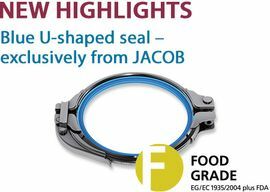 What does the new JACOB FOOD GRADE range cost? We sell our new FOOD GRADE range at no extra cost. 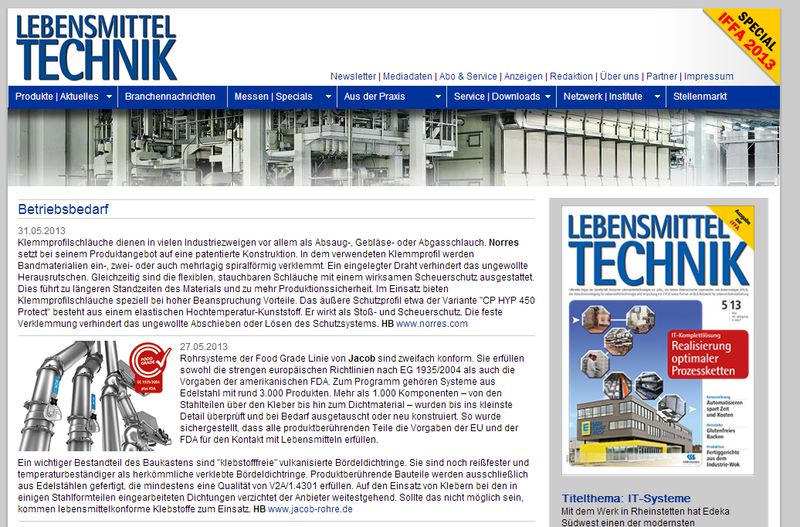 You pay only the prices given in our catalogue for stainless steel components and certain accessory parts. How can you order our new FOOD GRADE RANGE? You can order our FOOD GRADE range just as conveniently as all our other products in our online shop (http://shop.jacob-rohre.com), by email (sales(at)jacob-rohre.de) or by fax +49 571 9558-240. Ask for a FOOD GRADE declaration of conformity. 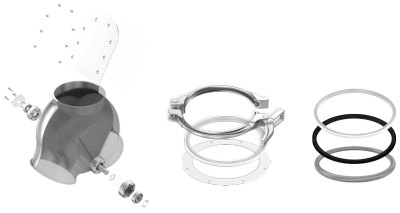 The new JACOB DETECTABLE DESIGN series provides increased safety, for example in food production. All products in the DETECTABLE DESIGN series can be detected with customary metal detectors and comply with EC 1935/2004 regulations, as well as FDA standards.